M&A activity within North America and Europe recorded its fifth consecutive year with total deal value exceeding $3 trillion in 2018. Results were driven by a continuous flow of mega-deals, especially in the technology and media sectors. The materials & resources sector – driven by Bayer’s acquisition of Monsanto and subsequent asset divestitures – registered standout results as well. This took place despite a pullback in public equity indices on both sides of the Atlantic. Additionally, interest rates were on the rise for much of the year in North America, making acquisition financing more expensive. While interest rates remained relatively steady in Europe, it was for all the wrong reasons. Economic growth in the region is slowing substantially, and several economies – including Germany and France – are nearing a recession. Healthy deal-making kept purchase-price multiples elevated, inching up to 9.6 times. Interestingly, these multiples rose in Europe – hitting their highest level on record – and fell in North America, even though the latter appears to be performing better economically. Part of the upward push in European multiples was likely driven by the jump in median deal value, rising 34.2% year on year to $34.2 million, because larger deals tend to transact at higher multiples. Cross-border M&A was hit by a wave of protectionism, much of it likely due to the US’s more isolationist rhetoric, dissuading foreign – especially Chinese – entities from purchasing US-based assets. Other countries and regions are pushing back on globalisation as well. Global growth looks to be stalling, which tends to dampen M&A activity, especially cross-border. Finally, M&A is becoming more institutionalised. With the count of PE and VC-backed companies surging throughout the year, a higher percentage of M&A targets are either backed by professional investors or publicly traded than ever before. Swelling asset bases for PE and VC make it increasingly likely this trend will continue for years to come. 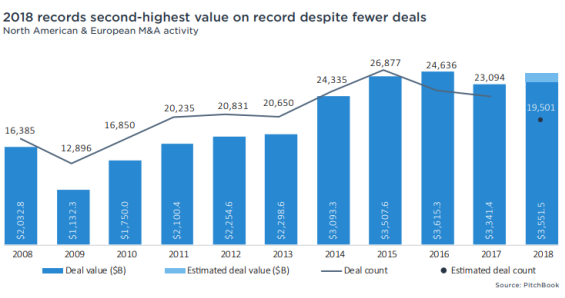 Voracious deal-making on both sides of the pond pushed 2018 M&A deal value to the second-highest value on record. The year ended with 19,501 deals closing worth a combined $3.6 trillion – a 15.6% decrease and a 6.3% increase from 2017, respectively. Overall deal value came in just 1.8% below the 2016 peak even as total deal count was down over 20% compared with the same timeframe. Low interest rates – though higher than in recent years – and a demand for yield fuelled easy access to debt financing in both regions. Additionally, a rising interest rate environment may have pushed many buyers to lock-in prices today, rather than waiting for financing costs to rise, which could lead to marginal deals no longer making economic sense. The year had myriad notable deals, including six priced above $50 billion. Telecom giant AT&T (T) purchased Warner Media – owner of media properties including HBO and CNN – for $85 billion in the year’s largest transaction. The vertical consolidation move creates a company that loosely resembles Comcast (CMCSA) – which purchased NBC Universal in two transactions over a two-year period for a combined $23.2 billion. The deal also shows how content distributors are vying for content creators, though not always with success. Telecom rival Verizon (VZ) took another path, acquiring AOL for $4.4 billion in 2015 and Yahoo! for $4.5 billion in 2017 – the combined company was named Oath. In December 2018, Verizon took a $4.6 billion write down on its Oath investment. 2018 also saw the materials and resources sector hit a decade high deal value. One mega-deal – Bayer’s (BAYN) $63 billion acquisition of Monsanto – sparked a massive spike in the sector. To win approval from regulators, Bayer divested two business units to Germany-based chemicals conglomerate BASF (BAS). Both of these transactions became megadeals, with BASF purchasing the Bayer seed and herbicide business for $9.4 billion and the Bayer vegetable seeds business for $8.8 billion. The sole megadeal in the sector that did not stem from the Monsanto acquisition was The Carlyle Group’s (CG) $11.8 billion leveraged buyout of AkzoNobel Specialty Chemicals – later renamed Nouryon. Carlyle used a hefty €6.4 billion loan package to finance the deal. Going forward, the M&A landscape appears to be changing. Incessant talk of a coming economic slowdown is propelling many businesses to taper spending and expansion plans, which itself could lead to an economic slowdown. Furthermore, the US saw part of the yield curve – the three-year/five-year spread, not the more watched two-year/10- year – briefly invert for the first time since the financial crisis, typically an omen for a recession. Leading economic indicators will need to be closely watched in the coming year.